Rukmini Iyer's luxurious filo chicken pie recipe is packed with flavour from pomegranate molasses and earthy walnuts. 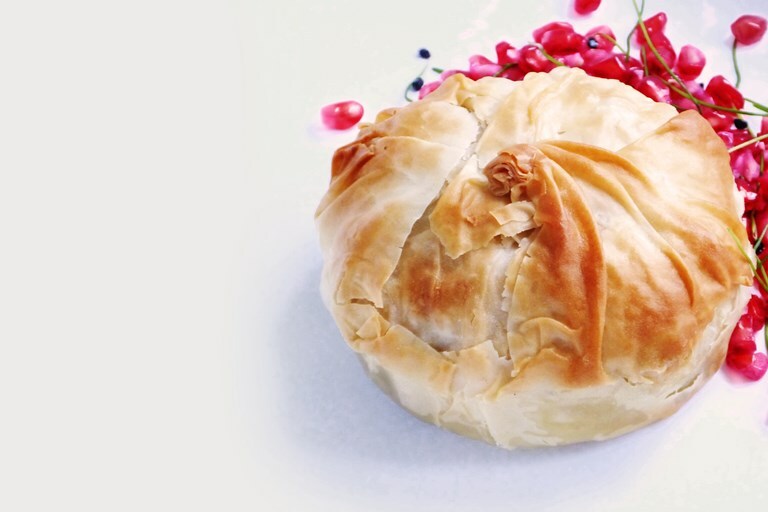 She serves these mini pies with a fragrant coriander chutney to cut through the sweetness of the sticky pomegranate. These chicken thighs, slow cooked in pomegranate molasses until it falls apart like pulled pork, make a wonderfully rich pie filling. Here I’ve suggested making a filo pastry shell, but you could just as easily use puff or home made olive oil shortcrust to make hearty, warming picnic pasties. Any leftover chicken filling is also fantastic warmed up in tortillas with sour cream for emergency late night snacking. You will need 4 x 10cm mini pie dishes.